HEY! Have Questions before you rent? We will contact you to answer them! Off-Season Inquiries will be answered by end of April when offices open! or 8 people with children. 20ft Pontoons holds up to 9 or 10 adults. 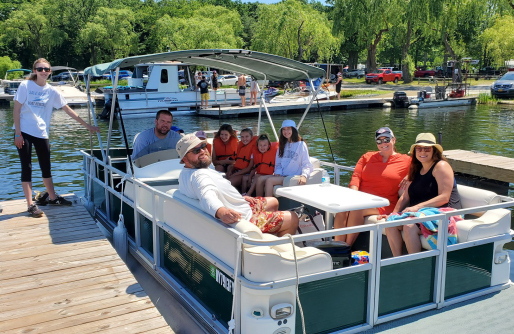 Our bowriders feature the lowest prices in our fleet and on the lake! With 7 adults, there is room for a cooler and storage. They are equipt with a stereo system, anchor, life jackets and everything you will need. FREE TANK OF GAS INCLUDED! Half day is only $347. Full Day is $478. 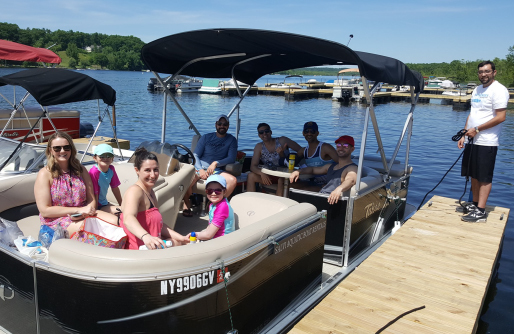 20' Pontoons: Our pontoons are a great option for larger groups between 7 to 10 people. A FREE TANK OF GAS INCLUDED! Half day is only $427. Full Day is $598. 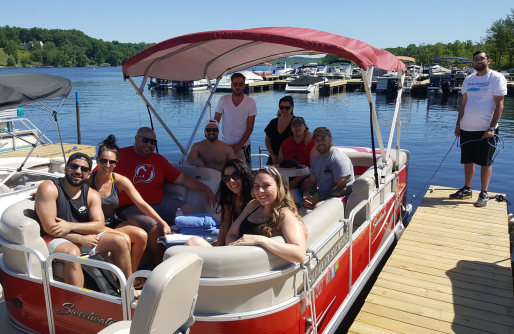 Half day time slots run 9:30am-1:30pm & 2:30-6:30pm for our 1st pontoon and 10:30am-2:30pm and 3:30pm to 7:30pm for our 2nd pontoon. For more details regarding our boats along with photos, please click on "Request a boat" on the top of this page. Unfortunately, due to insurance reasons; we do not permit tubing or water skiing. Call us 9am - 5pm, 7 days a week! Highest Quality Rentals at Saratoga Lake! See our Photo Gallery of our customers! At Salvi Aquatic, you get a whole lot more for less compared to what other Marinas on Saratoga Lake could provide! No hidden fees. NO GAS OR OIL CHARGES and great customer service! We want you happy being part of the Salvi Aquatic Family! We keep our boats clean & maintained. We are not afraid to show you photos unlike other marinas. Are you fishing? We also have Fishing Pole rentals! Poles are only $20 each for the time of your rental. We have additional fishing hooks and stick worm baits as well. Keep in mind, a NYS fishing certificate is required which can be obtained online at the DEC website and printed at your own computer or at most large retail centers with a sports section. In order to rent a bowrider or pontoon you need to be over 21 years of age with a valid drivers license. No boating license is required. All rentals are booked via phone or email and processed on our website using the online reservation form or on the phone with our staff. Upon arrival you will go through a short 10-15 minute safety training. In this training you will learn about basic operations of the specific boat and its safety features. We will have you undock and dock the boat you are renting at our marina with our staff on board so you are safe coming back alone. You will also need to bring your drivers license upon arrival. In order to rent, rentals must be made online or via phone. Open 8am-8pm / 7 days a week! 1-866-538-9370 extension 702. Leave message via our reservation system and our staff will call you within 30 minutes or less during normal business hours! © 2016 Global Pop LLC. All rights reserved.